We all have things we are good at and things we like doing. From swimming, golfing, and basketball to painting, reading, and crafts, we choose to spend our free time doing the things we enjoy. Cleaning your home is usually not on the top of most people’s lists of things to do for fun. At Integrity First Professional Services, we take pride in cleaning your house and making it a place enjoyable to come home to. We love what we do and the satisfaction in helping others brings us great joy. Below are the top benefits to hiring a house cleaning company. Saves you time. Our lives are insanely busy, especially if you’re a working parent. Between work, school, and the kids’ extracurricular activities, you probably arrive home exhausted with dinner still to cook. The last thing you want to do is clean. A house cleaning company will take cleaning your house off your plate, so you can spend your precious spare moments where it matters most: listening to your kids’ day at school, reading them books, and relaxing with Netflix. Cleans the spots you miss and then some. 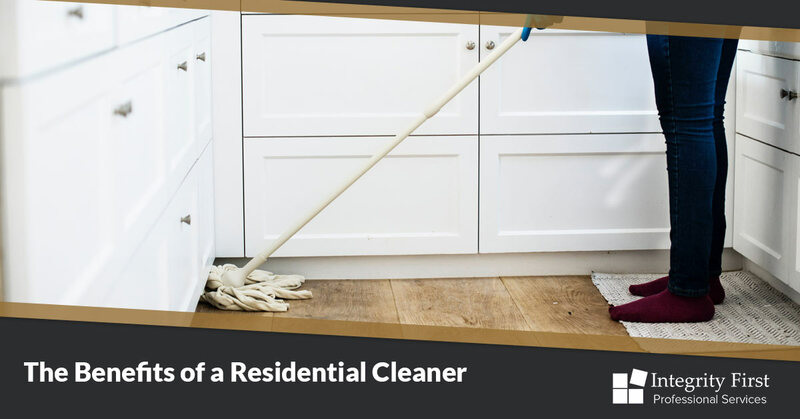 With a residential cleaning service such as Integrity First Professional Services, we are experts at getting the hard-to-reach places as well as the spots you often don’t think to clean. We will wipe down your blinds, your baseboards, dust the top shelf of your bookcase, and clean the top of the microwave. We take the time to do a thorough cleaning job, so your home shines bright every time we leave. Saves you money. This is a benefit most people don’t think about. Most people spend between $500-$800 a year on cleaning supplies alone — this is not factoring in the time you spend buying these products and doing the actual cleaning itself. Depending on how much you value your time, a house cleaning company can save you thousands of dollars in a year. Furthermore, if you factor in potential home repairs caused by lack of cleaning (such as mold in the bathroom that would require a professional to remove it), this figure could balloon fast. Prevents mold and dust mites. The bathroom is the one room most of us hate cleaning. Unfortunately, bathrooms are usually a haven for several kinds of pathogenic organisms, including bacteria, fungi, mold, and viruses. A professional house cleaning company such as Integrity First Professional Services will ensure your bathrooms are spotless and germ free when they are finished. Furthermore, dust is one of the leading allergens behind the cold and flu. Dust mites also cause many allergic reactions. Hiring a house cleaning company who will dust all surfaces on a regular basis will keep you and your family healthier and dust-free. Integrity First Professional Services serves the Greensboro, NC, and surrounding areas. We offer the best house cleaning services at the best prices. We use only green cleaning products, which does not expose you and your family to toxins as well as does no harm to the environment. We put customers first at Integrity First. Call us today for a free home visit and price quote, and start reaping the benefits of a professional home cleaning company today!